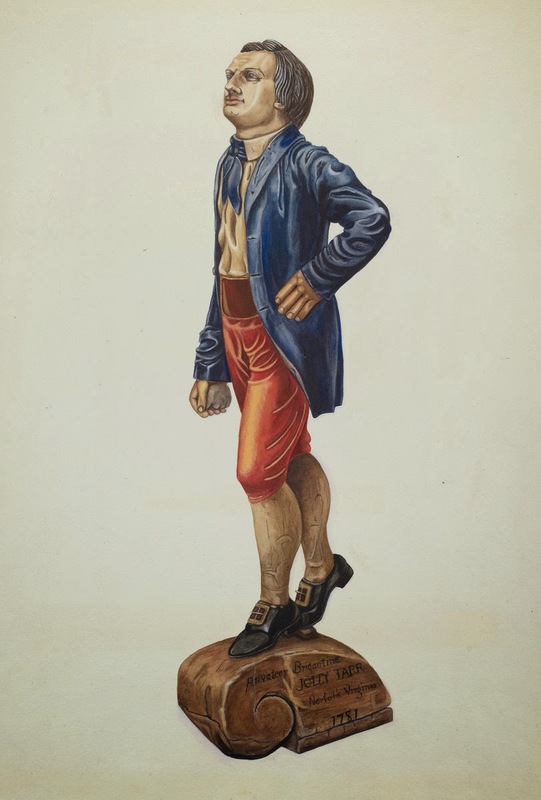 Figurehead of the Jolly Tar, artist unknown, c.1781, Mariner's Museum. "Figurehead: Jolly Tar," Mary E. Humes, c.1935, National Gallery of Art (US). The second image above is an early 20th century artist's representation of the original wooden sculpture in the collection of Mariner's Museum in Virginia. The figurehead of the American brigantine rigged privateer Jolly Tar represents the vessel's namesake. I don't usually include later representations, even of original pieces, because the primary source (if available) should always be deferred to. Even the most well meaning and detailed attempt at recreation can lose something in the interpretation. I'm still going to use it. The original figurehead is two hundred and thirty years old. In that time, some of its paint may have broken down or faded into colors which are no longer truly representative of the original piece. It is possible that Humes saw the figurehead when it was closer to the original colors than it is today. The Jolly Tar wears his hair short and is without a hat. His neckcloth is a dark blue and tucked neatly beneath his collar. The short jacket is single breasted, without buttons, and has no cuffs. Clasped in his right hand is a rock, perhaps a reference to the role of seamen in the mobs that agitated in the decade leading up to the outbreak of the Revolutionary War. Humes portrays the figurehead as wearing a pair of red breeches with a wide belt and without a fly. The image of the original in the Mariner's Museum appears to have a more narrow belt, though this may just be the forced perspective of the photograph. It further appears that the original is dressed in brown breeches, but this could be the result of a breakdown of the original paint on the piece. As an aside, here's a piece from the March 5, 1782 Pennsylvania Gazette about the successul haul of the privateer Jolly Tar! You can learn more about her at AWIatSea.com.